This website is intended for people of all faiths to discover and explore this wonderful country. ﻿We will make sure you arrive at the correct starting point by car or public transport and not lose your way during the hike. And before you start, we will help you understand the history of the locale, and point out some of its geography, botany and geology. All the material on this website is copyright. It can be reproduced for personal use only. Why is this website different from other hiking websites? Many of the hikes in the countryside are circular, thus obviating the need for 2 cars. Many of the hikes can be reached by public transport. Hikes are graded on a one to five star system so you can choose the most appropriate hike for you and your family. Nearby attractions in the area visited are linked to the web. All the bike rides are on asphalt- covered roads and/or reasonably smooth cycling trails and are suitable for a hybrid bike. There is no paid advertising. Stay informed about new entries of tiyulim and essays. Suggest improvements and additions so that this becomes a worthwhile website for everyone. We now have a hiking group - the In and Around Jerusalem Hiking Group. All the hikes are free. They are advertised on our Facebook page and in the events section of the Jerusalem Post. Write to arnoldslyper@inandaround jerusalem.com to be placed on the mailing list. This page contains a summary of the 23 walks within Jerusalem, including the Old City and 6 nature hikes within the Jerusalem Municipal boundaries. All are easy to reach via city public transport. This page has a summary of 17 hikes in the Judean Mountains, all of them west of Jerusalem in the Jerusalem Corridor. All the hikes are graded. 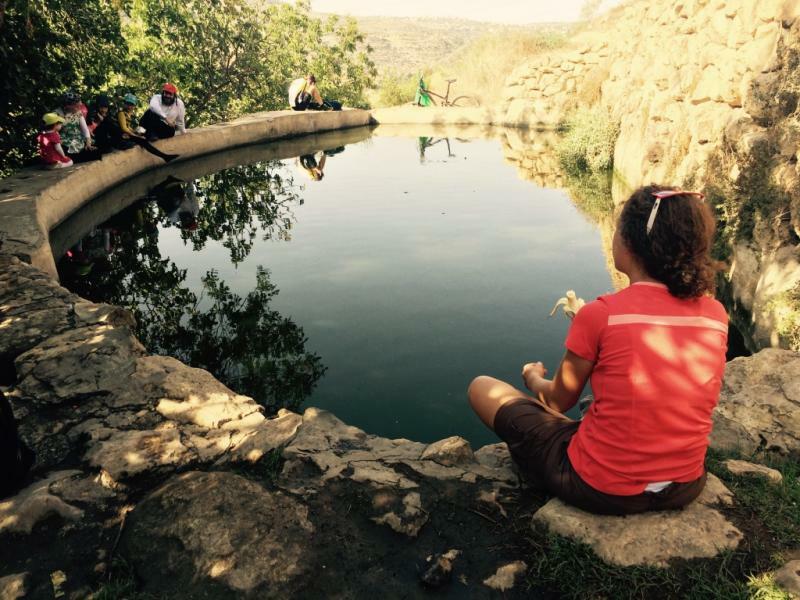 5-star hikes are usually ones that are also popular with Israelis. Most of the hikes are quite close to Jerusalem and can be reached by public transport. There is also an essay on "The Geology and the Topography of the Judean Mountains". This page provides a summary of 9 hikes in the Shefela, all west of Jerusalem and between the Judean Mountains and the Coastal Plain. Most are most conveniently reached by car, although details for public transport are also provided. There is also an essay on "Introducing the Shefela". The Judean Desert is east of Jerusalem and the hikes are reached via route 1 going from Jerusalem to the Dead Sea. There is a page on this descent, including a description of the city of Ma'ale Adumim and places of interest that can be visited on the way to the Dead Sea. The hikes in Ein Prat, Ein Mabu'a, Ein Qelt, and Nahal Og are also reached from route 1. There are 4 hikes along the Dead Sea, including 2 in Ein Gedi. Another page describes the Jordan Valley and places of interest to visit. Most of the hikes can be conveniently reached by public transport. This page summarises 3 "5-star" hikes south of Jerusalem and also contains a list of other activities in the Gush. Visit by car or by public transport. There are 3 sites in this section - Nebi Samuel just north of Jerusalem, Beth Elo and Shilo in Samaria. Cycling is a wonderful way for getting to know the country. The rides here are for families and not serious mountain bikers. All are suitable for hybrid bikes (i.e. half-way between a thin-wheeled and mountain bike). Two are on paved roads and suitable for a thin-wheeled bike. For 3 of the bike rides there are nearby rental places that rent out mountain bikes. There is one location on this page. This useful page has a list and brief description of natural pools and swimming pools in Jerusalem and around Jerusalem. For fuller details just click on the link. Some, such as those in the Judean Desert, are of exceptional beauty. Others are more utilitarian. Unless you are a hotel guest, hotel swimming pools in Jerusalem are usually pricey and are not included here. You will miss out a lot touring Israel without some basic knowledge of the history of the Jewish people and this country. This timeline and list of essays will help fill you in. Almost all the hikes outside Jerusalem are on jeep trails or footpaths and are not suitable for strollers or a wheelchair. However, there are a few exceptions. Most of the walks in Jerusalem are on paved roads, and those without many steps are suitable and are included here. Our apologies if you find a link on the website that does not work. When we add a new page, it often breaks links to other pages, and we are continually redoing the links. However, you can also reach every page using the dropdown on the left. Prior to the Six Day War, Jerusalem was a divided city and access to Jerusalem from the rest of the country was via a land corridor from the coastal plain. After the Six Day War the city was reunited. The status of the captured territories was subsequently defined by the 1993 Oslo accords. Area A is territory under security and administrative control of the Palestinian Authority. Area B, which is relatively small, is territory under Israeli security control and Palestinian administrative control. Most of the Arab population live in areas A and B. Area C constitutes the majority of the captured territory and is under exclusive Israeli security and administrative control. Many of the main roads through Judea and Samaria pass through area C, and many Israelis travel these roads without giving it a second thought. Since everywhere around Jerusalem, except westwards, is beyond the Green Line, you are likely travelling in area C whenever you travel outside of Jerusalem in a northerly, southerly or easterly direction. Is it safe to travel on these roads in area C? There is no easy answer to this question. It depends where and when - and your tolerance for even minor risk. Route 1 from Jerusalem to the Dead Sea is in area C and passes by neighborhoods of East Jerusalem. Most people would consider this route quite safe. Similarly for route 90 through the Jordan Valley, route 60 to Gush Etzion, and route 443 to Modi'in. However, there has been occasional stone throwing on these roads. The solution? Ask knowledgeable Israelis before you jump into your car, particularly if you intend driving north into Samaria. The free app "Waze" is a wonderful program for travelling in Israel. It was developed in this country. By default, this program does not direct you through areas A and B. These roads are in any case well signposted. Waze will redirect you in the event of severe traffic congestion. When it does this, it's worth looking at where it's taking you and you can then decide whether it's worthwhile. Waze understands and can direct you in English, but there are many English spellings for place names and sometimes it may not understand what you have written. For this reason, only English place names that are recognized by Waze are included in the directions for each destination on this website. Waze does not avoid towns in East Jerusalem, and depending on where you are going, it's worth checking on the route on which Waze is taking you (just click on the top of the program). If you are not sure where the places are, look on a map. For example, for travelling from Maale Adumim to the center of Jerusalem, Waze will direct you through the Arab area of Wadi al Joz (because this is the quickest way). There has been very occasional stone throwing at Jewish cars here, and some people may choose to ignore this direction from Waze. Helpful information for visitors to Jerusalem: Buses usually announce each stop and this information is available on the notice at the front of the bus; but the bus will not automatically stop unless someone has pressed the button to do this. These buttons are conveniently placed close to most seats. Unless you are a pensioner, you can no longer pay for a bus ride by giving the bus driver cash. However, there are easy-to-use machines located at all light rail stations and other places that take a credit card or cash.﻿ However, paying for a trip this way does not allow for free transfers between buses and the light rail. Much better is to use a Rav-Cav. If you anticipate staying in Israel more than a day or two and will be using public transport it is definitely worth getting a Rav-Cav, a smart electronic card. These can be prefilled at the machines at all light rail stations and each ride permits you 1½ hours of free transfer multi-rides by bus or rail. Without a Rav-Cav, you will need to pay each time you transfer. Other contracts are also available, such as monthly or weekly travel, daily pass, or stored value contract. An anonymous Rav-Cav can be purchased for 5NIS from a bus driver or Rav-Cav issue station. A personalized RavCav is free, but can only be obtained from a Rav-Cav issue station. Bring along your Israeli ID or passport. To see how many journeys are remaining on your card, place your card in the machine and this information is shown on the bottom left of the screen. Itravel Jerusalem is the website of the Jerusalem municipality. It provides a very helpful list and description of the many upcoming events arranged by the Jerusalem Municipality. Also a listing of tours inside and outside the city, nightlife, restaurants, hotels, hostels, vacation rentals and bed and breakfasts. Fun in Jerusalem is a useful website, especially for families with kids. The site includes fun activities, camps, chugs and a city guide. It even has a babysitting service. Israel B (Israel is your bayit) is a website containing resources useful for English-speaking religious people in Israel. It includes shiurim, Shabbat happenings, and single events. The website of The OU israel Center at 22 Rechov Keren Hayesod in Jerusalem describes a very comprehensive program of daily shiurim, lectures and social events In English. They also have a travel program with frequent tiyulim. Tel: 02 560 9100. office@ouisrael.org﻿. Janglo is an invaluable site for English-speakers in Israel and includes relevant news for English speakers, information about events, and adds for jobs, housing etc.